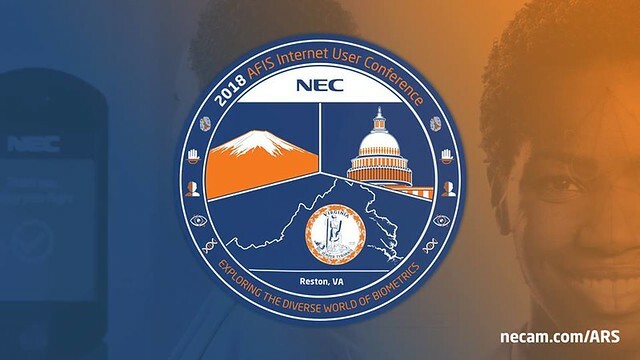 Our 32nd Annual AFIS Internet Users Conference, held in Reston, VA, was a highly successful event. It brought together professionals from around the globe, and with its proximity to our nation’s capital, we were pleased to host a number of our Federal clients as well. Together, we explored opportunities and issues impacting the public safety and law enforcement community in the near and long term future. In this time of digital transformation, attendees learned more about new techniques in forensics, experienced the latest in identification technology solutions, and how biometrics and AI can help provide a more secure, convenient and frictionless experiences for all of us. This year’s conference was enhanced by dynamic speakers from U.S. and international law enforcement agencies (e.g. Toronto Police Services) and U.S. Federal government agencies discussing their use of biometrics and analytics technologies in meeting their challenges and success stories. Our keynote speaker, none other than Secretary Tom Ridge, the First Secretary of U.S. Department of Homeland Security and former Governor of Pennsylvania, kicked off the three-day event discussing the evolution of our country’s security profile, the role technology plays in securing our borders, and the trends impacting local, regional and state public safety officers and investigators. One of the highlights of the conference is the opportunity to network and socialize with other like-minded professionals who are facing the same issues and daily challenges. The Winery at Bull Run was a unique venue that provided a fun atmosphere of comradery for our two groups! The conference closed with the 2018 AFIS Awards Banquet. This was a time to recognize the newly elected AFIS Internet, Inc. Executive Board and to honor recipients of the AFIS Internet 2018 “Biometric Hit of the Year Award.” Deputy Norman Kandil with the Hamilton County Sheriff’s Office was recognized for his use of the new Facial Recognition program on a theft case that not only resulted in the arrest of the unknown suspect; it also took the Detective down an unknown path that ultimately lead to the conviction and sentencing of two additional suspects. Hector Hernandez with the Bexar County Sheriff’s Office received the award for his work as a Latent Print Examiner on a human smuggling transport case resulting in the death of 10 immigrants. Other agencies were unable to identify the tenth victim, but Hector was able to get an impressive Print (Finger) hit to positively identify the last victim. Congratulations to all, with our sincere gratitude for your service! I would like to express my sincere thanks and appreciation to the AFIS Internet Board and our host agencies, the Virginia State Police and the Virginia Department of Forensic Science, for their dedication and tireless efforts in organizing this conference. This year’s AFIS Executive Board, Host Agencies and volunteers did a fantastic job of providing relevant topics, with outstanding speakers who engaged, educated and inspired us. We now look forward to 2019 and hope you will plan to join us next August 25-28 in Scottsdale, AZ. Meanwhile, you can check out or relive the excitement by viewing our photo gallery or our AFIS 2018 recap video. If you’re a fan of any of the detective shows available on television and streaming services, you’ve probably seen an episode or two where a crucial part of solving the fictional crime is using face-recognition software to identify potential suspects. It’s the digital version of an old-fashioned police lineup. The scenario usually involves detectives finding an old photo or obtaining some grainy security camera footage of a suspect. They turn it over to a colleague in a crime lab, where the photograph or video is quickly processed to identify the subject. While it may not work exactly as seen in the movies or on a television crime drama, this type of digital matching technology is very real and in use today. With more people having camera equipped cell phones and individuals and business installing surveillance cameras, the amount of available video evidence that can be used to solve crimes has greatly increased. Not having the ability to leverage security video footage and photo evidence can be costly and time consuming for law enforcement departments with limited resources and heavy case loads. NEC’s Advanced Recognition Systems (ARS) group has a long history of providing the latest biometrics technology to government customers like our NeoFace® Reveal software, NEC’s high-speed matching facial recognition system. When it was independently evaluated by the National Institute of Standards and Technology (NIST), part of the U.S. Department of Commerce, NEC’s NeoFace® algorithm achieved the highest performance evaluation as the most accurate face recognition solution on the market for “one-to-many” video searching. Watch the video to see how NEC’s ARS group worked with the City of Irving Police Department on a deployment of NEC’s NeoFace® Reveal facial recognition software, which has resulted in high success rates in providing fast, accurate suspect identification intelligence. It has led to increased public safety and decreases in departmental costs by saving detective man hours and reducing the need for added personnel. Want to learn more about Advanced Recognition Solutions from NEC? Let us know and we would be happy to provide you with an overview from one of our subject matter experts. Ladies Pro Golf Association (LPGA) founded in 1950 is a premier professional women’s sports association that provides programs, instruction, tournament play, as well as charitable events through its foundation. Recently, at the ANA Inspiration Tournament in Palm Springs, California, the LPGA and NEC worked together to pilot a program that provided facial recognition solutions for safety and security of its fans, players, and tournament staff. The pilot also provided a unique VIP experience for its media and other credentialed patrons to create frictionless entry into various secured environments around the golf course. Player, fan safety and a pleasurable customer experience are of the utmost importance to the LPGA, which prides itself on providing a safe, fun, family friendly event. To help ensure this experience during the ANA Inspiration event the LPGA used NEC’s NeoFace Express rapid access solution to eliminate long wait times by accurately identifying media members, tournament staff all while keeping a watchful eye for known persons of interest to law enforcement by searching against state/local and national law enforcement databases to keep potential threats away by alerting the appropriate authorities. Take a moment to the watch the video below to learn more about how NEC’s facial recognition solution was leveraged at the tournament. Hey Buddy!, I found this information for you: "Changing the Game for Contact Center Technology". Here is the website link: http://nectoday.com/changing-the-game-for-contact-center-technology/. Thank you.